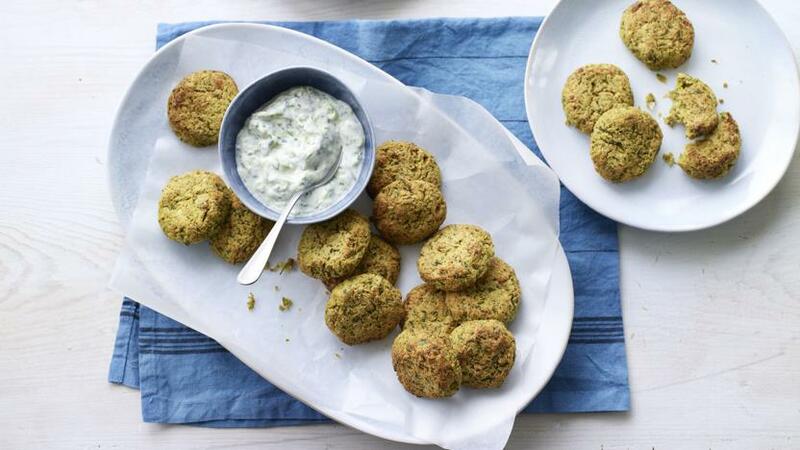 These easy falafels are made with fresh herbs, garlic and spices and are baked with a small spray of olive oil to keep the calorie count down. Preheat the oven to 230C/210C Fan/Gas 8 and line a baking tray with baking parchment. Heat the olive oil in small frying pan over a medium heat. Add the onions and cook for about 10 minutes, or until softened and starting to brown (add a splash of water if they start to stick). Remove from the heat and leave to cool. Put the onions, chickpeas, garlic, spices, salt, chopped herbs, flour and some pepper in a food processor. Pulse until the mixture is fairly smooth, stopping every so often to scrape down the sides with a spatula. You want to retain some texture but the paste should be able to hold together. Divide the mixture into 18 equal pieces and shape into patties. Place on the prepared baking tray and spray the patties with 10 sprays of oil. Cook on the top shelf of the oven for 20–25 minutes, or until golden-brown. For the tzatziki, put the yoghurt into a small bowl. Squeeze the grated cucumber to remove excess liquid, then add to the yoghurt with the garlic, mint, salt and sweetener. Mix well. Lower the oven setting to 200C/180C Fan/Gas 6 and move the tray of falafel to the bottom shelf of the oven. Bake for a further 20–25 minutes, or until cooked through. Sprinkle with a little salt and serve with the tzatziki. Don’t forget to give the cucumber a squeeze to prevent the tzatziki being too wet.